The nearest underground station is Temple which is on the Circle and District lines. The nearest train stations are City Thameslink and Blackfriars. Chambers is within the London Congestion Charging area. Parking within the Temple can often be arranged by prior appointment. Some short stay meter parking is available in the streets to the East and West of the Temple. There is a long stay multi-storey car park on Queen Victoria Street, close to Blackfriars station. Birmingham New Street station is a 15 minute walk away from 3PB's Birmingham chambers. Snow Hill station is a 3 minute walk away from 3PB's Birmingham chambers. There is a B4 car park a short walk away from chambers. For further information or for directions please contact us on 0121 289 4333. Chambers is about 10 minutes walk from Bournemouth Station. If travelling by car, the entrance to the car park is via the slip road on St Swithuns Road, immediately after the junction for Knyverton Road. Please note that there is no facility for disabled access. Please contact the staff to make alternative arrangements. Bristol Temple Meads station is a 10 minute walk to Chambers. Chambers has limited car parking so please confirm in advance with the Bristol clerks. The entrance to the car park is on Bath Street (Sat Nav Postcode BS1 6BN). There are metered parking spaces close to chambers in Redcliffe Street and St Thomas Street. 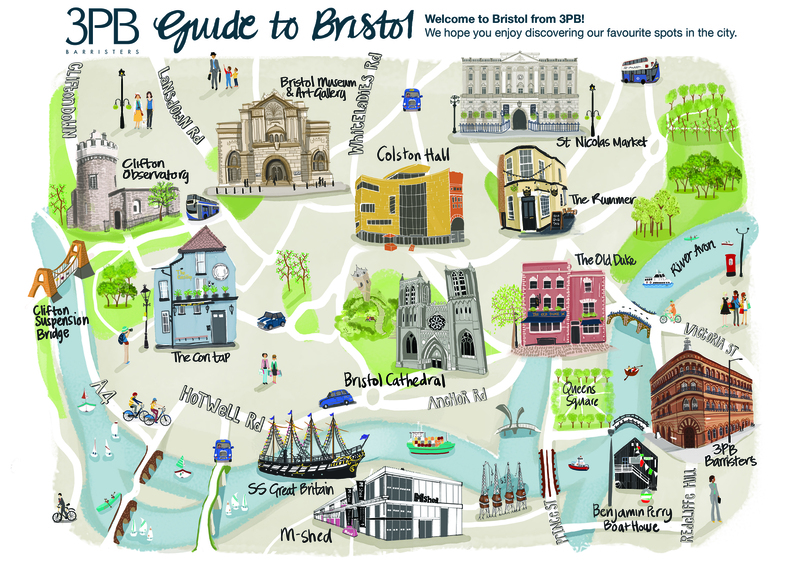 See our guide to our favourite spots around Bristol here. Chambers is about 10 minutes' walk from the station. If you prefer, there is a taxi rank situated at the station. There is on-street parking on either Beaumont Street, St Giles or underground car parking off Gloucester Street. Oxford has an excellent park and ride system with four car parks situated to the north, south, east and west on the ring road. Chambers is located in very close proximity to Winchester station. Coming from the north, leave the M3 at junction 9. Coming from the south, leave the M3 at junction 10. Follow the signs for Winchester, then City Centre. At the roundabout just before the statue of King Alfred turn right and follow the one way system to the multi-storey car parks at The Brooks shopping centre. Parking is sometimes possible at the rear of Chambers but only by prior appointment.